On December 9-11, 2015, the International Conference “Regional Development Perspectives in Armenia” take place in the GovernmentReception House in Yerevan, Armenia. During the second day of the Conference, Olena Ruditch, a Community Development Specialist of theCBA Project, presented the joint EU / UNDP “Community Based Approach to Local Development” (CBA) Project. 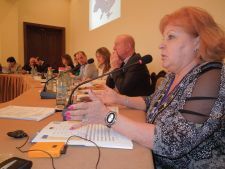 The presentation of Mrs. Olena aroused public attention and interest among the conference participants – representatives of different countries and international agencies. After the report of the Project representative, active discussion arose on implementation of experience of international projects, aimed at improving the people’s lives and development of social infrastructure of social objects. The first day of the Conference was devoted to Regional Development Policy. 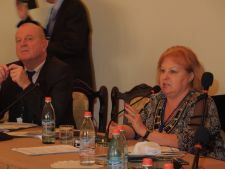 The Conference participants discussed the strategic view on Armenia, the role of the Armenian Social Investment Fund (ASIF) and Armenian Territorial Development Fund (ATDF) as integral actors of Regional Development and Community Driven Development, and they will celebrate 20 years of ASIF/ATDF. The second day was held as an International Forum. This day was in a form of a dialogue and discussion among policymakers, practitioners, implementers and researchers working in the area of Regional Development/Community Development. On the third day, there will be study trips to the Regional Development/Community Development project sites and potential project locations in Armenia. The participants of the Conference will have an opportunity to discuss the project sites and learn from practice.